These days technology is often the last thing I'd recommend schools bother with when trying to engage students. There's plenty else we can invest time in before technology will achieve even a fraction of what it can in an engaged school. And now a set of action research reports in the UK is showing the path many schools might wish to take. I'm working with several primary (elementary) and secondary (high) schools at the moment in England, Australia and the States. All of them face the same daily and long-term strategic challenge: students have never been so disengaged. Many have seen technology as a principal hook to reverse this disengagement, which is why they get in touch with us, but quickly on my initial visits to schools I'm keen to point out the other steps that we need to get through before technology will add what it could do. Otherwise, I'm just a tools salesman, selling tools that the owners don't know how to harness. The journey is a complex one, and one that, in my opinion for what it's worth, most of the 'big' eduction commentators in North America still fail to recognise. I've complained numerous times before about the fetichisation of 'tools' and 'edtech' by those who work with and in schools where other elements of the teaching and learning process clearly deserve fetichisation first. A unique and undervalued research project based in the UK, with partners in the US (including High Tech High), is discovering, analysing and sharing those elements through its regular pamphlets, blog and, above all, grounded practice across nearly 50 schools. It's our job to help scale this ambition to other schools around the world. The irony, for commentators like Alfie Kohn, is that invariably, “when interest appears, achievement usually follows” (2000, p. 128). It is almost as though we have accepted the inevitability of learning as a cold shower: you’re not expected to enjoy it, but it will do you good. We have recently seen a large number of students becoming disengaged achievers, performing well academically, keeping out of trouble, but rejecting further and higher education. If we have greater aspirations for students—beyond compliance and toward a commitment to lifelong learning—then the conventional concept of engagement is inadequate. Students are absorbed in their activity: anyone witnessing a young person playing, say, on-line role playing games will know what this looks like. It is rare, however, to see such depth of absorption in school-based work. Munns and colleagues (2006) at the University of Western Sydney (2006) have quantified the difference as being in-task, not just on-task. Other indicators of high absorption would be students wishing to continue beyond the end of a lesson, or not even noticing the lesson had ended—what Csikszentmihalyi (1990) has described as being in ‘‘flow’’. Picture of engaged gamer from Mr Toledano. Does anyone want to join me in Canada May 17 & 18 for INPlay, Toronto? You can register now for one of Interactive Ontario's showpiece events, on whose advisory board I sit (well, mostly I Skype, actually). It's unique in bringing together such a blend of transmedia, video game producers, financiers, marketers on the one hand, and researchers, educators and policy people on the other. The programme is superb, with keynotes from Amy Friedman on Play, Warren Buckleitner on why some highly marketed games failed so miserably, Russ McLeod on How to Build a Movement for connected youth, Alan Gershenfeld's Leveling up from Player to Designer: Empowering Youth through Media Creation and a sneak behind the scenes of Gever "Tinkering School" Tulley's journey to turn his one week summer school of student-led learning into a full school, the journey to Brightworks. When Newton discovered gravity it wasn't because he was told by a teacher or even because he had the skill to look it up in Wikipedia. It was because he was provoked, deeply, and had the design skills to create a beautiful equation. Gever Tulley and Ewan McIntosh help delegates experience first hand, the durable learning that comes from deep provocation. Explore how curriculum can be turned on its head, how new skills can be learned best, how content can be explored through the same models of discovery that genuine scientists, creatives and leaders harness every day. I think I'll be blogging like crazy for two days, and catching up with some great friends, old and new. If you want to join the fun and mental stimulation, with the social stimulation to back it up, register before April 14th to get the early bird rate. Learning Without Frontiers - Disruption, Innovation and Learning, this January 9-11, just before monster education show BETT, is a must-attend to kick off your education technology year, and the last of 2000 tickets for the event are on sale now. And if you buy your Premium Pass before November 30th you will get an iPad thrown in to your ticket pass, a ticket to the March "Evening With Sir Ken Robinson" event and a seat at the Learning Without Frontiers Awards. Get in now before they get snapped up! I'll be at the event, capturing as much as possible on the blog and my YouTube channel. Tom Chatfield, author, Fun Inc.
Take a look at video from previous events to see the world class speakers on offer, and grab your Premium Pass ticket and free iPad before November 30th. Other cheaper tickets are also available at the moment. Tom Chatfield's seven key video game takeaways are incredibly useful for those redesigning curricula (or their classroom practice) who want to tap into the power of video games. My colleague Derek is always at pains to point out that "good teachers use good tools at the right time", but I still meet folk who miss that, and still feel that a lesson without games-based learning can't be as exciting as those with it. Tom notes in particular the potential in using gamer progress bars as indicators of academic and personal progress. He cites the University of Indiana as one of the cutting edge institutions working in this way. That said, though, I'm sure when even I was at primary school we had a class chart that we filled with shiny stars every time we progressed in our learning or worked particularly well. Was my Year 1 teacher Mrs O'Hare inventing game mechanics in 1982 without knowing it? Much in the same way as we can learn from how social networks operate in order to. say, make our own virtual learning environments work better, without the need to feel we need to harness Facebook for learning, I'd say that there are seven gems in this talk that show how we can harness games mechanics for learning from tomorrow morning, without feeling the need to learn the practicalities of bringing in Xboxes, PlayStations and Wiis to the classroom. One thing - to get what these mechanics are, it still helps if you've experienced them first hand by actually, erm, playing a game. Something for your Christmas holiday homework, perhaps? Imagine being able to interact with content on the screen, with a game or experience, without needing any console control at all. That's what Kinect does (formerly project Natal for XBox 360), and it's about to dramatically change the way things are made in games, as well as experienced. The video above shows the well-trodden animals-pets genre in a new light, but the technology brings a whole new console-control-less angle to sports and dance games. No more dance mats or flying Wiimotes! Milo, in production by Peter Molyneux's Lionhead, will be unveiled at TED in a couple of weeks, where Peter's company seek to give users a sense of wonder like they've never had before - a computer game-experience where your computer game can hear you and talk back. 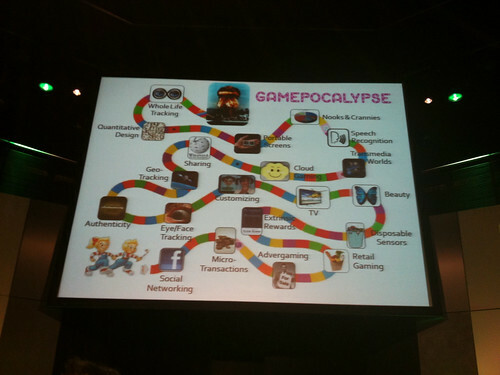 It's what Jesse Schell saw as part of the final picture in his Gamepocalypse. In the space of two days at GameHorizon we've gone from about to happen to happening in two weeks. That's a pace of change. Jesse Schell sees games reaching out to real life and real life is reaching into games. He imagines a world, and sees increasing evidence of, the gamespocolypse: where every part of your life is part of playing a game, from brushing your teeth to eating your Cheerios. Some people think this sounds horrible, others like Jesse think it's going to come anyway, so we might as well learn how to do it as well as possible. View more presentations from Jesse Schell. Networks - let's say, erm, Facebook - propagate material that is helpful, funny, controversial or just amazing. Material that is poor quality, that is viral in a bad way, bombard us every day. Our Facebook immune systems are getting stronger, repelling good content as well as bad, since it's easier to turn off all notifications from games or from my Wall on the basis of a few bad experiences, rather than to filter for the good stuff. For developers, this means the spammy ways of sharing your games and ideas have to change. Retail gaming is bringing huge potential in partnerships between Farmville-maker Zynga and 7-Eleven grocery stores. By choosing which Farmville-themed cup you'll have for your milkshake you are actually playing Farmville. TV Commercial time has, since 1950 to 2010, gone from 13% to 36% of the television schedule. Its encroachment into the games space is inevitable. When we think about how the best brands have used other media, we see how it can work for both brand and individual: Harley Davidson and Tattoos. Everything is becoming more and more beautiful, and this trend towards beauty effects every aspect of life and especially digital media. Coming up with functional just doesn't work any more. Television is evolving. Fast. 3D isn't new (in 1849 the stereoscopic lens came into existence), yet we don't see 3D photography, 3D signage or 3D books everywhere. Are we really going to see this take off in such a ubiquitous fashion? That said, by Christmas 2010 1 in 5 televisions in the UK will be internet-enabled. What does that mean for digital media? Games are adapting to take on me as the player rather than the avatar the graphic artist came up with. That's personalisation. Not just letting my type my username in before I play. Is playing Foursquare and taking twenty minutes to enter any building fun? Will it really become an engaging game? Take a look at OnLive - but ask yourself how the servers will be paid for? Cloud computing reduces the cost of storage and servers to 'near zero' if you read Chris Anderson, but it's less 'near zero' if you're paying the bill. Chris Swain notes that film only became the core of modern culture when they started to speak. It's when games start to listen that they become the core of our media experiences. When the method of control is above the neck, rather than below it, the medium will be elevated beyond the power of film, of any other medium for that matter. Schell imagines how this might change our morning drive from a routine of listening to the radio, to speaking to our games, taking games (safely) into new arenas and locations, with different groups of people. When so much gaming takes place in so little time that we actually devote to entertainment, the nooks and crannies elsewhere in our packed lives become the new places to play - eating, drinking, working (we've already got that with mobile games) and how about sleep? Portable screens easily fall prey to the Hype Curve. From the peak of inflated expectations, to the trough of disillusionment to the slope of enlightenment and into the plateau of productivity. Take a look at the iPad - where does it stand today? The slope of enlightenment? It must be when people are paying £500 to find out what it does! Bringing in more data from more real-time places becomes a fresh way to make games that change every second.